LONDON: British MPs head off for Christmas with just 100 days to go until Brexit, leaving a country in limbo with no divorce deal in place and total confusion over what happens next. Prime Minister Theresa May, who is holding her last question session of the year in parliament yesterday, has delayed a crucial vote on her Brexit deal to next month. Jeremy Corbyn, head of the opposition Labor Party, has accused May of trying to “run down the clock” so MPs will have to choose between her deal and crashing out of the EU. While the politicking continues in Westminster, many Britons are putting their lives on hold and delaying major financial decisions until the future becomes clearer. Retailers are complaining of a slump in sales in a normally busy period as Britons contemplate a post-Brexit future in which government forecasts say they will end up poorer. More than two years after a deeply divisive referendum and after months of negotiations with Brussels, the indecision of the country’s leadership is also frustrating for many. 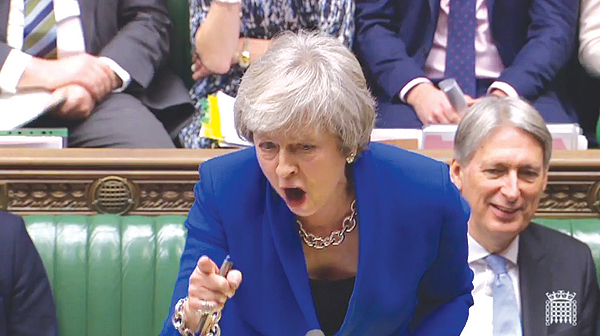 “There’s an overall mood of pessimism in the country at the moment,” said Tom Clarkson, research director at BritainThinks, which conducts surveys on public feeling. “Brexit is the worst kind of politics. It’s very Punch and Judy. It’s the kind of Westminster politics people hate.” In ordinary conversations this Christmas, the word Brexit is being replaced by the euphemistic “The B-word” to avoid groans of despair or a revival of long-running family feuds. Experts agree that May is likely to lose the vote on her deal, but are divided over what might happen next as there is no majority in parliament for any alternative option. Without a deal before March 29, Britain will still leave the European Union in a chaotic end to its 46-year membership that could trigger a financial crisis. A cabinet meeting on Tuesday stepped up planning for a no-deal scenario, after which Defense Secretary Gavin Williamson informed parliament that 3,500 troops would be on standby to help with “any contingencies”. Despite the apparent economic risks, some hardline Brexit supporters back a so-called “managed no-deal Brexit”-leaving without an overall agreement with the EU but with individual ad-hoc deals to minimize disruption. Many MPs are instead calling for a second referendum to end the impasse and give Britons the chance to think again. May has ruled this out as deeply undemocratic since 52 percent voted to leave the EU in the 2016 referendum. Another possibility that has been raised by cabinet ministers in recent days would be for parliament to hold a series of non-binding votes on different Brexit options, giving MPs greater influence on Brexit strategy.